Equi-Heart Pledge: Make the Most of Your Pledge: Write Your Gems of Wisdom Down! Make the Most of Your Pledge: Write Your Gems of Wisdom Down! If you are anything like me, you get super excited every time you gain a new insight or healing from horse, but if you don't write it down, within 30 minutes, you've forgotten and that gem of wisdom? Well, you never apply it to your life where it can works it's magic!!! Sound familiar??? 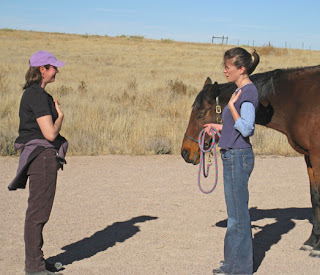 So, as I was hanging with the herd preparing for the Pledge yesterday, Serendipity reminded me that for many people, writing down the wisdom, inspiration, and healing they get from Horse is an important key to remembering it. When people have something solidly in front of them, it's often the catalyst for beginning to implement it in their lives. My suggestion? Make sure you take some time to jot down some notes after you tune into Horse each day! To make that even easier for you and to help you make the most of your time with Horse during the Equi-Heart Plege, I put together an E-Workbook for you to journal your wisdom each day and, importantly, how you want to apply it to your life! By answering the 5 Daily Questions, you'll have a motivating, empowering, and inspiring record of all of the wisdom, guidance, and healing Horse is offering to you. Plus, you'll be guided to set an intention before you begin and you'll review your progress at month's end. And all along the way, you'll be inspired by equine photography of the Healing Herd at the Happily Ever After Holistic Healing Horse Ranch- whispering their motivation to you! Like the Wisdom Horse Meditation, it's priced at only $3.33 so everyone can have this useful tool to transform their lives! Or buy them together for only $6 and you'll have a duo of empowering tools to super-charge your Equi-Heart Pledge! Or, make your own journal to ignite even more powerful transformation during your pledge. Either way, here's to a Wisdom-filled Pledge filled with awe, wonder, and amazement!